Most people didn't see last week's City Council meeting where the eruption of a $8.35 liability owed Suez, the water vendor was discussed. Many don't care for reasons political and personal but the public is learning of it and about as thrilled as the last time they "discovered" bills in the $10 million ballpark in a prior administration. the council declined to sponsor the Administration's proposed contract. Notice the calm demeanor of the council who was rebuffed from asking questions of the City auditor prior to the meeting. Then ask yourself, what does not compute? The discussion shows a striking lack of intellectual curiosity among those working within the administration on the exploding million dollar costs. But is it logical to assume no one knew? Here's the video from some of the key moments with the City Council and city auditor. Eye opening. It will remind many of the old Hogan's Heroes show with Sgt. Schultz who would often say in a pinch, "I know nothing." Shades of Hoboken government past with double digit costs owed in the millions. The city auditor writes in a letter released at the meeting there are significant costs. No one at City Hall had the slightest desire to quantify those "significant" costs in seven figures annually? The City's auditor Steven Wielkotz is asked about reporting and disclosure requirements. He states he had found out about the actual $8.35 million liability a day earlier as nothing was disclosed to him. Councilwoman Tiffanie Fisher inquires about the obligation to disclose and the million dollar costs associated with the bulk water costs being tabulated annually. 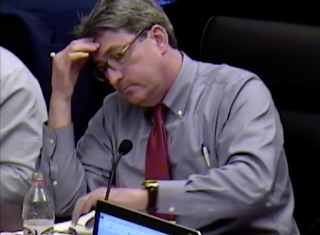 Councilman Dave Mello follows along similar lines and Mr. Wielkotz admits if he had been told he would have been under a professional obligation to include the "material" costs at least in a footnote. "Until yesterday, I did not know what the numbers were. They were never supplied to us. So it's hard to disclose something when you you don't have the information," Mr. Wielkotz says. Councilman Ruben Ramos follows with the $1,000,000 dollar question, "How do you enter into negotiations without knowing those numbers? How does the mayor?" City Council President Jen Giattino poses another question. "If we owe $1.2 million.. liability from last year, would you say it's okay you don't have to disclose it, you don't have to appropriate, it doesn't have to be in the audit because you're going to negotiate sometime in the future? "I have an obligation as a professional to disclose what I believe needs to be disclosed that's material in nature. If I knew about it, if it was quantified, year by year there would at least have been some disclosure," Mr. Wielkotz replies. Talking Ed Note: Reference is made to a 2015 conversation within the Administration. It's all but admitted without a complete figure running in seven figures with the bulk water costs, millions annually since 2014 are piling up. Yet no one sought to tabulate what the million dollar cost actually was? Councilman Ruben Ramos wondered aloud how one can negotiate a new contract extension without tabulating the millions in monies owed as part of the City's negations with Suez? The question points to ignorance not being an option. Someone clearly knew and avoided seeing it tabulated and disclosed to the City Council members and Mile Square residents. The millions in liability were clearly known and discussed just not disclosed to the City Council and the Hoboken public. There's an election coming this November. Mayor Zimmer is trying to get Councilman Ravi Bhalla elected mayor as her successor.